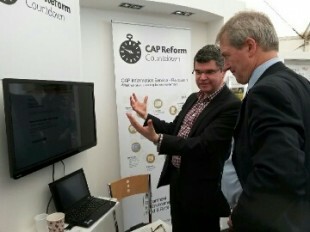 The team on the CAP Reform stand had a really good day at the Cereals Show near Royston on Wednesday and were back on Thursday for another sunny session with farmers and agents, showing them the new online application and payment service being developed for all CAP schemes, CAP Information Service, and answering their policy questions. The excellent weather helped entice the crowds, with hundreds people coming to visit us at the CAP Reform stand on both days, to find out more about Tuesday’s Ministerial announcement, which clarified the features that can make up Ecological Focus Areas, and to discuss other areas of greening policy. On crop rotation, farmers are telling us that they are looking to see how they can best meet the rules, while also making the best decision for their business. There was also a lot of interest in the new CAP Information Service and dozens of visitors sat down to try using it. We got questions on a range of areas, including whether the new service will be able to accept shape files (not yet, but in time), how the EU defines a hedge (which we’ll announce in the coming weeks) and on the quality of Norfolk bacon (which is superb). "Cereals is a really good opportunity to talk to those who will be directly affected by CAP reform and the new service. I am really pleased with the positive feedback and with everyone's willingness to work together to help make this happen."